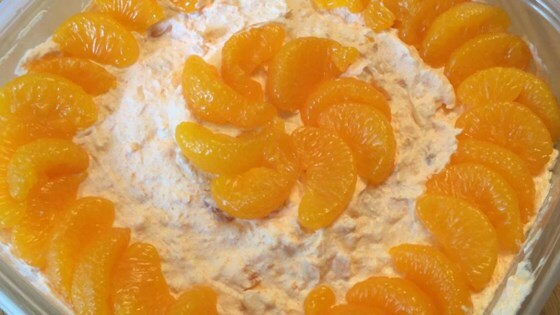 "This is a light and fruity orange dessert salad that is also cool and creamy!" Combine the well drained oranges and pineapple in a large bowl and mix together with the cottage cheese. Add the dry orange flavored gelatin powder and stir until well blended. Fold in the thawed frozen whipped topping and refrigerate for at least one hour. Interesting, but the cottage cheese was a bit overpowering. Made for an pukey texture. Try it with mini-marshmallows and shredded coconut. Yum! Good recipe. Only change we made was to cut the jello down to one box instead of two. Thanks for sharing. I made this Salad for Thanksgiving and it was gone within seconds. It is SO easy to make and Diabolic-Good ! !